The evolution and growth of new London microbrewery Fourpure over the last couple of years has been little short of astonishing. Set up as an avowedly keg-only brewery with a small range of typical 'craft beer' styles to target restaurants and the like, it has rapidly pivoted not only to produce a wider core range but also the regular specials and seasonals loved by an increasingly innovation-hungry market. And while it still doesn't do cask ale, it was one of the first in the country to adopt microcanning technology, scoring a notable win very recently when Marks & Spencer added two Fourpure canned beers to its range. Why was my Pale Ale leaning?! When I visited the brewery two months ago, it was a far cry from the near-empty shed I recall from my first visit back in 2013. 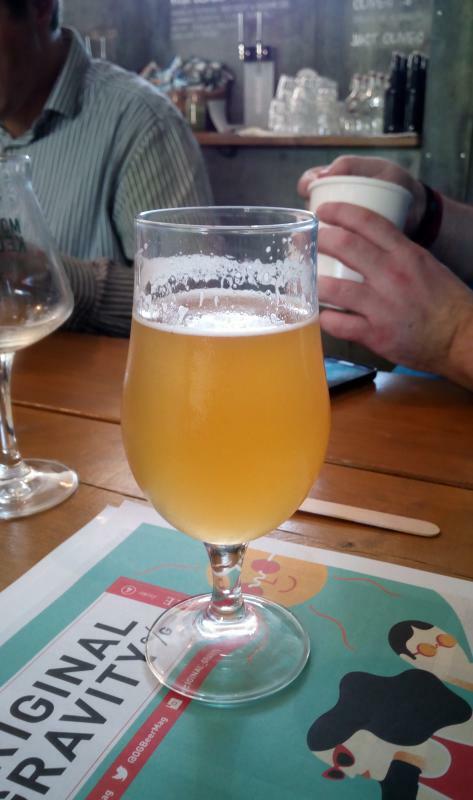 What little space wasn't filled with brewing and canning gear was heaving with people, enjoying both the two excellent specials being launched that day, a saisonbiere called French Farmhouse and a coffee-infused pale ale called Morning Moon, and the regular beers. So when the invitation arrived to the launch of two more new Fourpure beers, I knew I wanted to be there. We weren't at the brewery this time but at Mother Kelly's, a relatively new and very popular (except with real ale stalwarts, as it's keg and bottle-only) bar in increasingly hipster Bethnal Green. 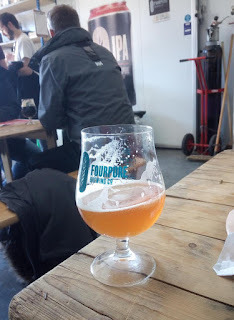 It has to be said this is a lot more accessible than the brewery, which is on an industrial site at the far end of the Bermondsey beer mile, invisible and not signposted from the road, so unless you know where you're going you won't find it easily. The new beers this time were a draught American-style wheat ale called Skyliner, a dry-hopped version of Fourpure's well-regarded (and canned) Pils, and a semi-secret second draught beer, a 3.7% sour ale called Hoptart. The recipe also needed to fit in with Fourpure's other brews: it was kettle-soured before boiling, so no extra microflora entered the fermentation vessels. This might give a less complex result (my words, based on Ron Pattinson's research and other stuff I've read around Berliner Weisse, not John's) but it keeps the brewery clean! "Why not do something sessionable that's also sour? Sour beer is only going to grow," John said. "My one worry is that people jump on the sour bandwagon and send beer out that isn't ready and without knowing what microorganisms are still alive in it - those things can live anywhere, including the beer lines." Moving on, I was expecting Skyliner to resemble the hopped-up Weizens that the Germans call Hopfenweisse, but this lacked all those fruity and spicy Hefeweizen notes. Instead it offered some grass and lemon and a bit of a grainy note, followed by an astringent bitterness that overpowered the rest. Not really my thing! To my surprise, the star of the three was the dry-hopped Pils. I'm used to Pilsners being samey and/or relatively one-dimensional, so I rarely seek out the style, but this one was right up there with the best of the new-wave German Hopfenstopfer (dry hopped) lagers. Pleasant leafy and herbal aromas lead you into a malty and lightly bready body, with grassy and citrus hops and a firm yet balanced crisp bitterness. Fourpure is now brewing up to eight times a week – it has a 20-barrel kit and eight fermenting vessels – and whatever it brews is already half-sold, John told me. Indeed, where two years ago I marvelled at how much empty space they had, they now need more room. I always considered Fourpure as being at the start of the Bermondsey Mile as it's so close to Bermondsey South. I'll look out for the Pils, their ordinary one is excellent and its a style that is notoriously difficult to get right. Good point - I usually arrive from the west, so think of Southall and A&H as the start, but of course the opposite is just as valid!